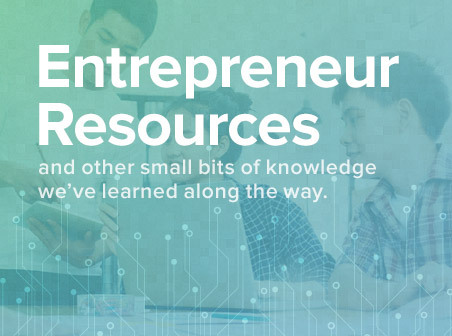 What a way to celebrate Global Entrepreneurship Week! The Camp BizSmart 2017 Grand Champion team, Atmoband, was invited by Randy Williams, CEO and Founder of the Keiretsu Forum, to pitch on stage at Microsoft, the product innovation design and go to market strategy that earned them the top title out of all teams competing this past summer 2017 in Silicon Valley. 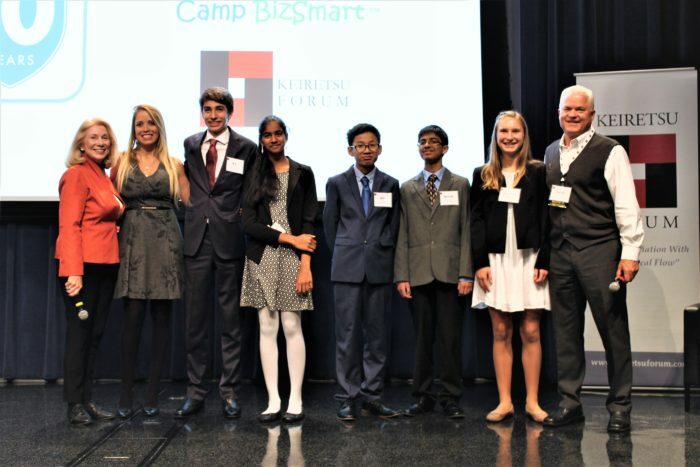 Having the Grand Champion Team appear at the Keiretsu Angel Capital Expo, has been an annual tradition since 2007, when the Keiretsu Forum became a strategic partner of Camp BizSmart. 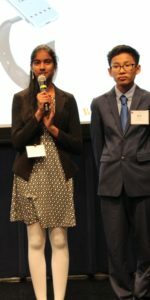 Students on the Atmoband team were: R.J. Faltinsky, CEO; Anushka Narasani, CIO; Bill Nguyen, CTO; Nirmik Tambe, CMO/VOC; and Beatrice Mihalache, CSO. Not pictured above, is Max Stengel, CFO who was unable to attend. Vera Kozyr, CEO and Founder of Atmotube provided the product innovation case to challenge the students to come up with a next generation product innovation for a personal air pollution monitor. After surveying potential customers, they found placing the monitor in a wristband would offer more portability and convenience for the user. The wristband displays the time as well as an LED light that signals the user the quality of the air they are breathing in. 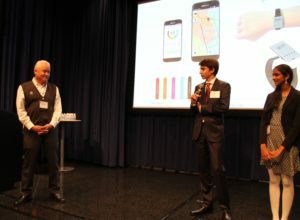 The device connects to a user’s phone via Bluetooth and with the Atmoband App, the user can see real-time updates of the air quality around them. The navigation feature in the app, plans out the quickest and least polluted routes for the user. The students identified China and India as first locations to that would benefited from this device. The inspiration to select this particular product innovation case came out of one of the team member’s sharing their personal family story of pollution in India where a family member lives and suffers from a chronic condition, noting that over 5.5 million people die prematurely each year from air pollution diseases, such as severe asthma, chronic obstructive pulmonary disorder and lung cancer. Knowing the quality of the air you breathe with a simple air pollution device, has the potential to give individuals who must monitor their air closely, information to help them make informed decisions to reduce their exposure and protect themselves from the pollutants that they might come in contact with. Nirmik Tambe and Beatrice Mihalache provide the final comments to Randy Williams questions. We thank Vera Kozyr, CEO of Atmotube, for providing this innovation case and their Camp Director, Marla Zemanek and terrific entrepreneur coaches and judges who inspired the students and provided great mentoring as they developed essential entrepreneurial skills and learned hands-on, the process of product development and go to market strategy. 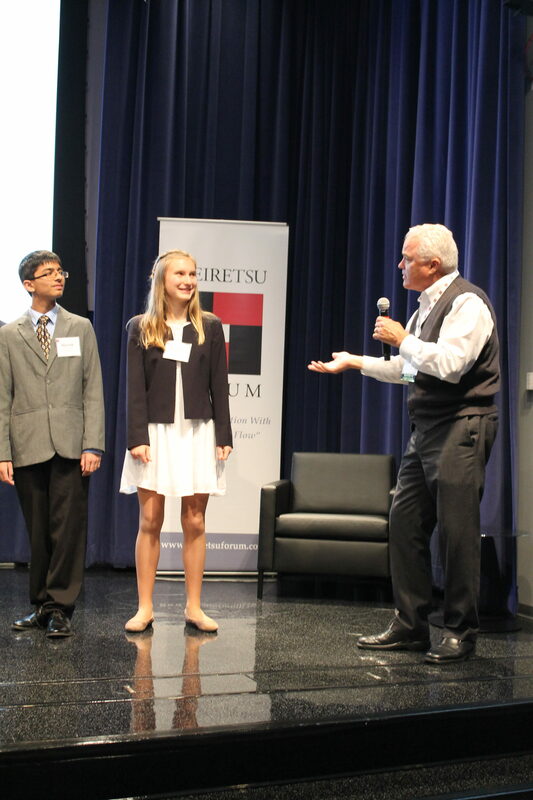 One of the competition judges to heard the teams original pitch was present for the event, –Bill Reichert, Managing Partner, Garage Technology Ventures and the first and longest advisor to Camp BizSmart. The Keiretsu Forum Angel Capital Expo makes it possible for Camp BizSmart students to hear the presentations by twelve companies who have be selected to pitch their business and product innovation to the premier gathering of the Angel Capital Community and to network with very successful angels and entrepreneurs. This year marks Keiretsu’s 16th anniversary and Camp BizSmart’s 10th anniversary. Among the presentations on Nov. 17, 2017, was Jim Brisimitzis, GM, US Startups, Microsoft, who led a panel with founders on the topic of raising capital. Microsoft has been a strategic partner of Camp BizSmart also since 2007 and Jim leads the Microsoft team working with Camp BizSmart. We are honored to be in such good company and to have the ongoing support of such a respected community of angel investors and entrepreneurs and companies. In addition, under BizSmart Global older teens and Camp BizSmart alumni may sign up for workshops and accelerators to take what they have previously to the next step. You may learn more on the Camp BizSmart site under Teen Programs.